We are nearing completion of Granit Director Robert Wilson’s house, which is being built as an exemplar retrofit project. 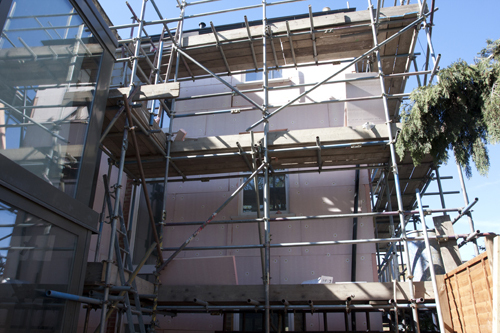 The external insulation to the solid walls has been applied and the final rendering is about to begin. The internal works are complete, bar some final snagging. 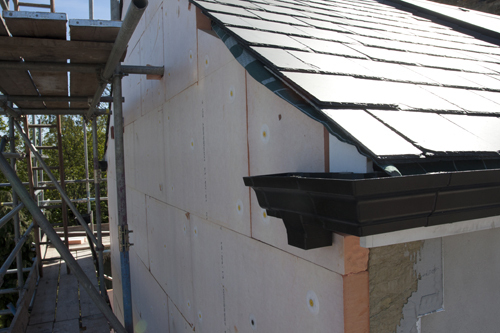 Once commissioned the house will feature solar heating, green roof and rainwater recycling, low energy lighting, a whole house MVHR (Mechanical ventilation and heat recovery) system, underfloor heating throughout, as well as every thermal element having been upgraded beyond current standards. On completion it will also be monitored to provide feedback which will allow us to advise our clients on retrofitting their own properties and sustainable refurbishment. Update: you can see photographs and a video of this project once completed here.